Margaret Deland (nee Margaretta Wade Campbell) (February 23, 1857 - January 13, 1945) was an American novelist, short-story writer, and poet. She also wrote an autobiography in two volumes. She was born in Allegheny, Pennsylvania. In 1880 she married Lorin F. Deland. They took in and supported unmarried mothers; it was at this period she began to write. Her poetry collection The Old Garden was published in 1886. Deland received a Litt.D. from Bates College in 1920. 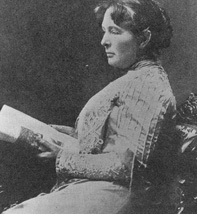 She is known principally for the novel John Ward, Preacher (1888), and her 'Old Chester' books, based on her early memories of Maple Grove and Manchester, Pennsylvania.